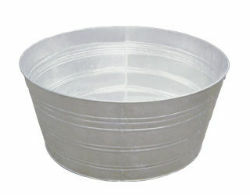 4 gallon "A" round tub. Hot Dipped For household and utility use. Side handles makes it easy to carry. Rust-proof, made with 100% recyclable material. Waterproof and fire resistant.